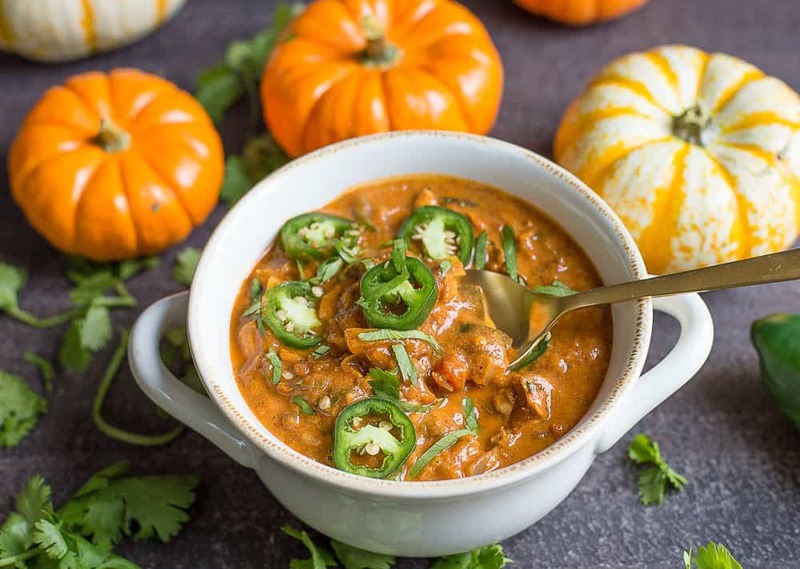 Pumpkin Chili has never tasted so good! This comforting bowl of chili makes a delicious fall meal, and is great to serve to guests. 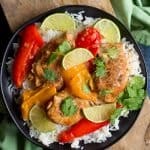 Flavored with two different peppers, spices, and a creamy texture everyone will love this variation! Paleo and Whole30 variations also included. 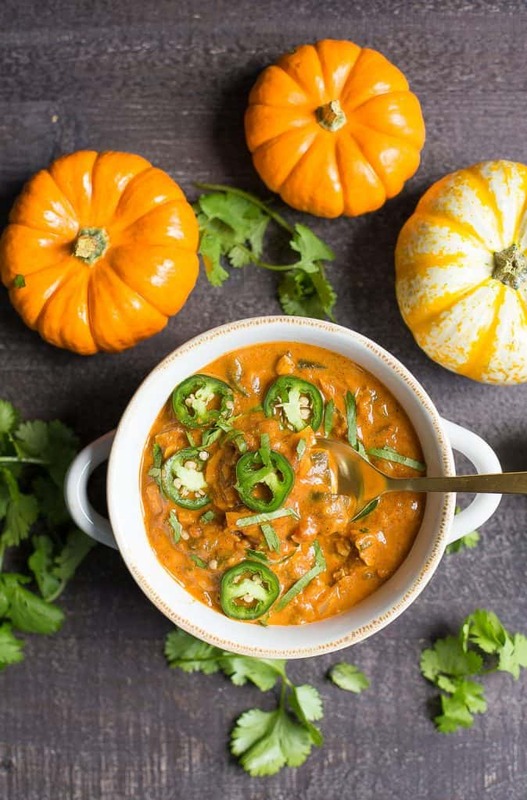 Are you on board the savory pumpkin recipes? I sure hope so, because I have something absolutely delicious to share with you! I am so glad I finally got around to posting this recipe. 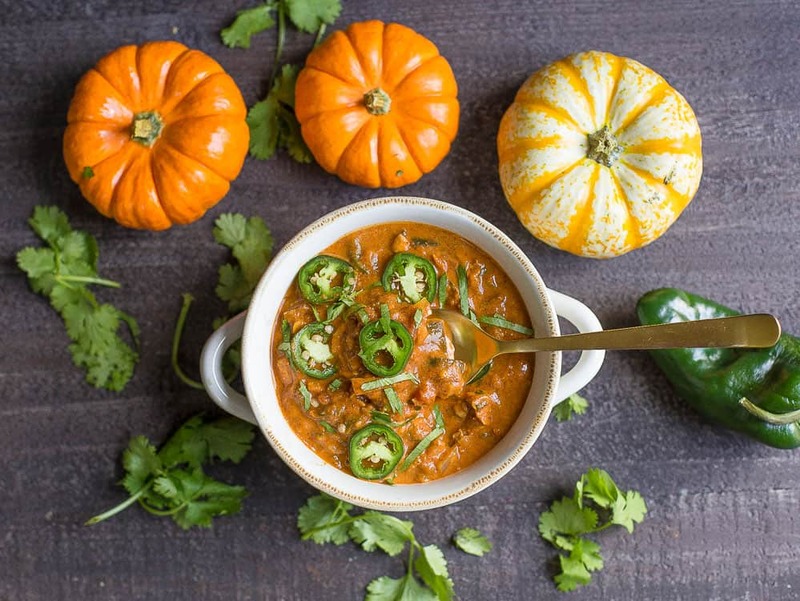 I created this Creamy Pumpkin Chicken Chili years ago while entertaining a group of friends for a scary movie night. They all absolutely loved it, and everyone immediately wanted the recipe. Since then, I have entered it (and won first place) in a chili cooking contest, have made it for many other guests over the years, and make it several times during the fall each year. I have several close friends who still claim this is their favorite recipe! And plenty who even make this in the spring. Totally okay with that, too. But here’s the thing…….What kept me from posting this recipe over the years, was that my original variation contains cream cheese to create this sour, and creamy texture. It’s pretty darn delicious. But since I have had a difficult time digesting dairy, I have generally keep it out of my diet completely. So while on Whole30 this past month, I figured I would come up with a way to enjoy it without the cream cheese. It wasn’t as good without the creamy texture, so I went ahead and added in something else……. Coconut milk and nutritional yeast. And while the flavor is a bit different than the original, it is still so darn delicious!! And just in case you were wondering (I’m sure some of you are), no coconut taste whatsoever. So friends, I am happy to give you a few options for this recipe. One with the cream cheese variation, and one without. This meal is sure to win over even the pickiest of eaters, and makes for a really fun chili variation for football season, and the fall in general. Don’t skimp on the garnishes!! I love mine topped with some cilantro, jalapeño, and plantain chips for a little crunch. For those not following a Paleo or Whole30 diet, also feel free to add in a can of Great Northern Beans. Begin by heating a large pot to medium high heat. Cut your raw chicken breasts in small chunks (or skip this and use pre-cooked chicken). Coat the pot with oil, toss in chicken and cook 3-4 minutes per side or until no longer pink. Set aside. Keep oil in pot (or add more if needed). Place onion in pot and cook for 3-4 minutes until fragrant. Add both poblano and jalapeño peppers. Cook for another 2-3 minutes until softened. Add chicken back to the pot. Coat chicken and vegetables with spices and salt. Add tomatoes, pumpkin, green chilis, and chicken broth and heat to medium high stirring for a few minutes to let flavors mix well. Reduce heat to low, and add coconut milk or cream cheese. Continue to stir until milk or cheese is well incorporated and creamy. Do you know the macros/nutrician content for tbis? where can I find the nutritional facts? You can enter them in to Myfitness pal, or there are other tools online too! I don’t post nutrition facts for my recipes. Do you mind sharing the original recipe that has the cream cheese? Sounds delicious!!! Hi Sally, the original recipe is in the recipe above!! Just use 8oz cream cheese instead of coconut milk. You can also add in a can of navy beans (white northern beans). Would ground beef be good in this recipe? Sure! I am not sure the creamy part would be as good, so I would make it with ground beef and without the coconut milk or cream cheese. I made this tonight and it was AWESOME. Kind of a random combination of flavors–coconut, pumpkin tomatoes, and jalapeños–but it was delicious and just the right amount of spicy. My new favorite recipe! can this be done in a crock-ppt if you throw all ingredients iN? Hi there, my concern with the slow cooker is that the flavor is really bold with the saute of the vegetables (onion, peppers, garlic). I think it could work, but might not taste as good. Unless you did a few minutes on the stovetop first. That would work! This looks awesome! Do you think it would freeze well? Hi Lizzie, it would freeze okay if you did the cream cheese variation. With the coconut milk, I would freeze before adding it. Then when you thaw and go to eat, add the coconut milk. Thank you! Update: the cream cheese kinda separated from the chili a little bit (if that makes sense) but overall very tasty and will make and freeze again! Made the whole 30 version last night. It was delicious and my husband couldn’t stop raving about it! He even asked if you had more recipes-He doesn’t know I was already planning on making your creamy bacon mushroom chicken with risotto tonight. Chili is awesome recipe and I will be making even when off plan- Keep up the great work! Thank you so much Wendy!! Love to hear this. And I think you will be totally obsessed the the creamy bacon mushroom chicken with risotto!! Also, my sheet pan recipes are some of my faves. The balsamic chicken with apples and bacon is one I make all the time! Enjoy! I’ve made this a couple of times with the cream cheese and it is delicious!! Everyone loves it. 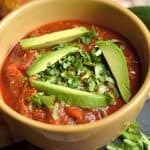 My go to chili recipe now! This one surprised me at how good it was. In addition to the cilantro, I’d highly recommend putting a couple spritzes – maybe a teaspoon or two of apple cider vinegar in the sauce to give it a little more pizzazz/tang, although perfectly good without. I was intrigued by the cream cheese because I happened to have a couple extra packs. Oh, and I also added some avocado chunks on top with a squeeze of lime. Hi Amy! This is the second time I’ve made this recipe with coconut milk and it was SO delicious and still very creamy. I can’t wait to make it many more times! I made this and it was AMAZING!!! Used more chicken stock than called for though…..
You mentioned using nutritional yeast, but I don’t see it in the list of ingredients. You’re right, it’s not in there! It’s an optional ingredient, you can add 2-3 tbsp for a slight cheesy flavor if going the coconut milk route. Love this recipe! So simple and tastes great. I customized it by swapping out some of the hot peppers for a bell pepper and added a cubed sweet potato and two diced apples for more fall flavor. I’ll definitely be making this again! I can’t believe how quick and simple this recipe was to make!! And so delicious and comforting on one of our first very cold fall nights!! 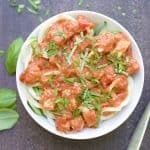 A definite go-to recipe!! I can’t believe how quick and simple this recipe was to make!! And so delicious and comforting on one of our first very cold fall nights!! A definite go-to recipe many more times this season!! We like to eat regular chili over baked potatoes. 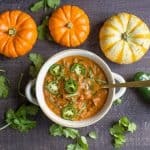 Would this pumpkin chili (whole30 version) work over baked potatoes too? Or maybe sweet potatoes? Sure! It would be delicious! My family, including 3 young boys, loves this meal! It’s a go to in our house for sure. Do you happen to have the nutrition breakdown for when made with full fat coconut milk? Thanks!! I made this with both the full fat coconut milk and the cream cheese. It was delicious!!!! I made this. Flavour wise, it packs quite a punch. But the sauce isn’t as thick as I would have liked it to be. I rounded it out by putting some roasted red pepper sauce in it. Gave it a lovely red curry like colour and a little more complexity to the pumpkin (which, no matter how hard it tries, will always be a little bland). 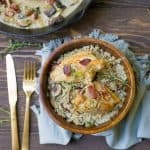 Overall a delicious chicken recipe that will keep me fed for days. Thanks!